I've tried a lot of vanilla cake recipes. The Vanilla Nirvana cupcakes didn't translate all that well to cakes. The Almond Anniversary Cake wasn't as good when I subbed vanilla extract for the almond. The Fluffy Vanilla Cake was good, but not great. The 1-2-3-4 Cake was the same story. Vanilla cakes are hard. They're not traditionally as moist as chocolate cakes, and even though there are tons of recipes out there, I've had a hard time finding one that stays moist and tastes super vanilla-y. It's so pure white, so beautiful. Not the easiest recipe to make, but so worth it. It's filled with pastry cream (my first time making it), and topped with the most luxurious Italian Meringue Buttercream I've ever tried. I'm usually opposed to making IMBC recipes that call for a pound of butter, but just this once, I actually had enough butter in the apartment to try. I've been putting off making this cake because I didn't feel like paying $9 for potato starch at Martin's or ordering it online. But then I found it for cheap at a cute shop in Harrisonburg called Grandma's Pantry! I'm pretty sure this vanilla cake is The One. Note: Make the pastry cream first! It'll need to refrigerate for a while. 1. Whisk egg yolks, half the sugar and corn starch in a medium heatproof bowl. 2. Heat milk and other half of sugar in a small saucepan just until it starts to boil. 3. Pour the hot milk mixture over yolk mixture and whisk constantly until smooth. Pour mixture back into saucepan and continue to cook over medium heat, stirring constantly until it comes to a boil and thickens. 4. Strain into a clean bowl and add butter and vanilla extract. Stir until incorporated. Cover bowl with plastic wrap and leave to cool. Once cooled, put in refrigerator. 5. Once chilled (takes ~30-45 minutes), take out of the fridge. In a medium bowl, whip heavy cream until soft peaks form, then fold into pastry cream. Re-cover and put back in the fridge until ready to use. 1. Sift flour into a medium bowl. Add potato starch, baking powder and salt, and whisk together. Set aside. 2. Pour half & half and vanilla extract into a small bowl and set aside. 3. In the bowl of an electric mixer, cream together the butter and sugar on the lowest speed for 3-5 minutes. 4. With the mixer still on low speed, add eggs one at a time. 5. Add dry ingredient mixture alternately with liquid mixture, starting and ending with dry. Don't wait until each addition is completely incorporated before adding the next. 6. Stop the mixer and scrape the bowl all the way down to the bottom of the bowl. Mix on medium an additional 15-20 seconds. 7. Prepare two 9" cake rounds- spray the bottom of each pan and line with parchment paper, but do not spray the sides of the pan (this will prevent the cakes from doming in the middle). 8. Divide batter evenly into the pans. Bake at 350 degrees F for 28 minutes (22 for cupcakes), or until the tester comes out clean. 9. Cool cakes 20 minutes in the pan. 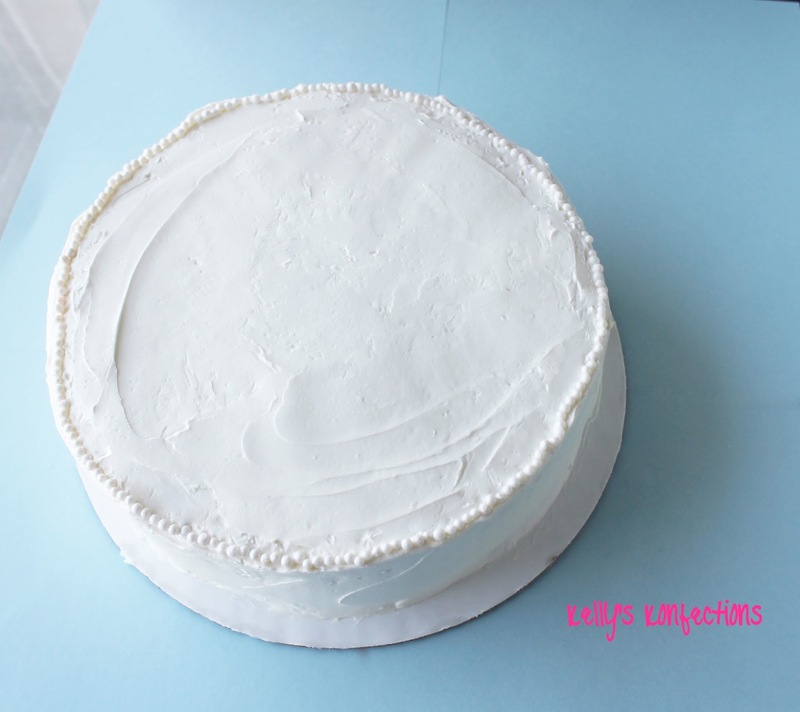 Use a small offset knife to loosen the cake from the rim of the pan. Carefully invert and remove parchment paper. Cool completely before icing. 1. Pour egg whites into stand mixer bowl fitted with the whisk attachment. Measure 1/4 c sugar into a little bowl and set next to stand mixer. 2. Measure 1 c sugar and the water into a 1-qt, heavy-bottomed saucepan. Gently stir to combine. 3. Clip candy thermometer into sauce pan, and heat mix over medium-high heat. Partially cover with lid to capture the evaporating water. 4. When the sugar syrup reaches 200 degrees F, turn stand mixer on (high speed). When the egg whites start to form soft peaks, slowly pour in the 1/4 c sugar. 5. When the sugar syrup reaches 245 degrees F, remove thermometer and slowwwly pour into the meringue, with the mixer still running. Keep the mixer running on medium for ~8 minutes, until the mixture has cooled down. 6. Turn mixer back up to high, and add the butter 1 tbsp at a time. After all the butter has been added, keep beating for ~2 minutes (you can add the vanilla at this point if you'd like). Spread pastry cream on first layer of cake, then stack. Place in freezer for 15 minutes to let it solidify (makes it easier to frost). Ice cake with a crumb coat, then let sit for 15 minutes. Frost with another layer, then decorate as you please. This cake is so good. So rich, so yummy! You'll have pastry cream and IMBC leftover. Enjoy!